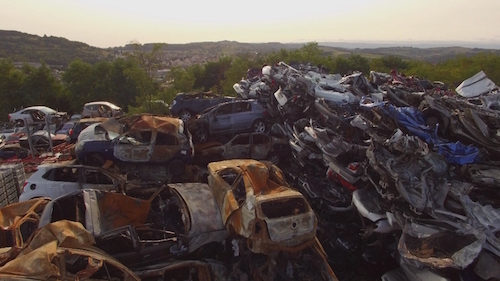 Every year in France, around 1 ½ million vehicles are taken off the road. Whether damaged in accidents or simply worn out, our cars, trucks and motorbikes end their lives in wreckers’ yards. And yet some of them enjoy a second lease of life, which is often illicit. Some of them will be used to disguise stolen vehicles. Others, which should have been crushed because they were too dangerous to be on the road, go back into service to become scams or caskets on wheels that could well cross your path. However, auto wrecking is also a huge business for the future. Not many people know this, but since 1 January 2017, garage owners are obliged to offer us secondhand parts to repair our cars. But few do this. Why? In France there are around 1700 auto wreckers recognized by the State. There are known as VHU centers, or centers for unusable vehicles. They are at the cutting edge of technology and produce very little pollution. Unlike the illegal wreckers, who are rife all over France. There could be more than 500 across the entire territory. They are not State-recognized because they do not respect the environmental standards in force. Our old cars are full of acid, oil, fuel, antifreeze and even explosive materials and present a danger to the environment if they’re not cleaned up properly. Fortunately, there are associations on the alert, who were gradually closing down these illegal wreckers.